Rick Gillis is at the leading edge of coaching people in how to circumnavigate the technology and challenges, in today's overheated job recruitment environment ... he shares tips on how to create a resume so that you get called for that all important job interview. In this interview he shares with you, his pre-resume technique that will help you get to the head of the short list for interview, and shows you how to write your resume so that recruiters sit up and take notice. I highly recommend Rick's book, "The Real Secret to Finding A Job", which you can either download from his site as an ebook, or purchase in paperback over at Amazon. Its filled with great resume tips and ideas that will help you get your foot in the door. Shelley: Today I am very excited. We've got a fellow that sat around with three guys in a dining room, which might sound a bit like the title of a sitcom, but those three guys in the dining room successfully launched Houston's first job board. It was in the '90s, and technology was rapidly changing how a job search would be conducted. Interestingly, only one of those three, Rick Gillis, is still active in the business of teaching others how to successfully negotiate the brave new world that job search has become. Formerly host of Rick Gillis Employment Radio in Houston, Rick is regularly interviewed on radio stations across the United States and Canada, including N.P.R. He was recently mentioned in The Wall Street Journal for his innovative short form pre-resume concept. Rick's most recent book on job search is called "The Real Secret to Finding a Job, Making Money or Saving Money." Please welcome, Rick Gillis. Hi Rick. Shelley: I'm terrific, thank you. And you? Rick: I am very well. Thank you very much. Shelley: That is good. How is recruitment different today from say 10 or 15 years ago, that potential job seekers need to be really aware of, particularly those who have been around for a little bit longer? Rick: One of the quotes that I express early on in my presentations is that job search is no longer about selection. It is about elimination. People have to understand that with the overwhelming number of resumes and online applications being received by hiring managers, and that is of all professions, whether it is HR, business owners, staffing companies, they are receiving so much, they are looking for any reason possible to eliminate, number one. The second part of that answer is that people have to take a new mindset to employment and finding their next position by stating how they are going to add value to an organization. I am continuously seeing, and I am sure you have as well, particularly from new college graduates, they always say, "I am seeking a rewarding and challenging career." I have got to tell you, in my position, if I was hiring right now, with the economy the way it is, all the taxes, fees, situations, we do not know if we are going to be in business next year, and for you to come in and tell me you're seeking a rewarding and challenging career, forget it. I am not interested in what you want. I am interested in what I need. Shelley: Absolutely. So turn the attention away from yourself and on to their (your prospective employer) needs, right? Shelley: Sure. You mentioned the recruiters are in overload, and look, the leaders listening in on our call today would be going, "Uh-huh. Welcome to my world." Shelley: When you are out in that job search arena, and knowing that recruiters are in that info overloaded, how does somebody stand out from the crowd? Rick: Let me answer the question in kind of a roundabout way. People think that when you lose your job or when you're looking for some new opportunity, you start by creating a resume. That is wrong. That is absolutely wrong! Where you start, and to answer your question ... how do you stand out ... you start by creating a personal list of your very best accomplishments, your achievements. They don't have to all be employment based. They can be stuff that you did, volunteer, charity, academic, military, whatever. But go in stressing previous accomplishments, previous achievements. The question you want somebody to ask you during an interview is, "How did you do that?" Because the real question behind that question is, "Can you do that for me?" Rick: I would also go a little bit further and say that you can use that same mindset to minimize age discrimination, because as you and I both know Shelley, age discrimination is rampant in job search. The way you beat that is by stressing your accomplishments, and don't stress them unless you can duplicate it ... you can replicate it, because if you are 55 and what you did at 25 you can't do again, then you are shooting yourself in the foot. However, if you are 55 and you still could create that sales campaign ... get out there and have the energy to drive it forward and implement it, then you should stress that because the relevance lies in the fact. Shelley: Yes, and are you still up to speed with what is going on today, not 25 years ago. Rick: That is very, very ... what you just said, you just said a mouthful right there. That is worth a topic. That is a show of its own, because too many people are not staying current with their skills. Shelley: I often say to people, "If you aren't learning, growing and developing, how can you learn, grow, and develop your people?" To me, that is critical to staying current in any operation. Rick: It is. It is. I will tell you, and it is interesting because I have talked with a couple of people in some of the national media in the U.S. and I have said, "I think there is a story there about former masters of the universe who no longer have the skills to even find a job." I regularly run across these CEOs, C-Suite people, who do not have the skills because they are used to somebody else doing it for them. Shelley: Absolutely. Technology is just so important. In terms of recruiting, that has just changed so much. Where before it was all paper based resumes, today much more put is online and things like that. What is your take on all of that? Rick: You are absolutely right, and I will tell you what I'm thinking as you're saying that is that we don't even know where all of this is going. This truly is a brave new world. The technology is doing that more and more, I was just reading something in one of the business magazines yesterday or the day before, stating that more and more young people don't even like using email. Rick: They want it short and sweet, and to tweet via Twitter is the way it is done. I have a friend in New York who told me she had attended, basically, a Twitter Job Fair, where everything you did was in 140 characters or less. It was kind of like speed dating. Rick: Yeah, so I don't know how that worked. She flat told me, she said, "I'm not sure if there was success there," but it is an opening to what we might be looking for in the future. Shelley: Sure. I interviewed somebody just recently about managing your reputation, and she was saying that the vast majority of companies are using Facebook to vet people before they even bring them in for interview, etc. Rick: I have to tell you that is fascinating you said that. I have just taken a position with a company working in a permanent part-time basis, and it is going to be pre-investigations based on social media and monitoring of employees based on social media to find out who is spilling the beans, who is disclosing proprietary information. Maybe you don't want to hire this person prior. It is a brave new world. This company just announced recently that they were going out for business, and I contacted them immediately because I am fascinated. I want to be a part of this. It is Big Brother-ish. I know it is Big Brother-ish. It is scary. But you know what, we are all doing it. Shelley: It is the way of the world, and you've got to stay with it. There is nothing else to be done. Shelley: I know from reading your eBook; "The Real Secret to Finding a Job," that you're very big on pre-resume. Can you share with people what the pre-resume is? Rick: Sure. Another name for it is the short form resume. I am a big fan of the short form resume, meaning a one page document. It is highly critical, and I have two reasons why I came up with this document. First of all, the pre-resume, by definition, means it precedes your long form resume. So anybody who would be listening, I am not telling them to throw out their current resume. However, I will tell them that they need to, they almost critically have to start off the job search when there is a place where you submit a resume, because let's face it, more and more times now it's an online application, you are going to utilize it. 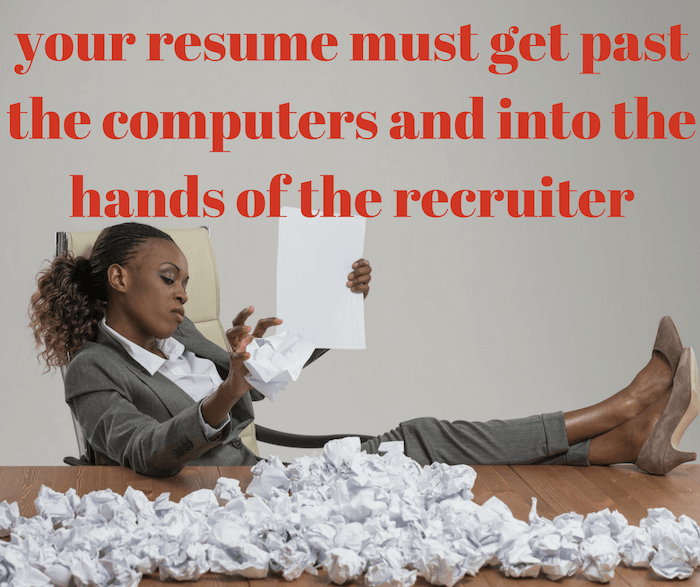 But when you are sending out the resume, a one-page document is very important for two reasons. Number one, the hiring professionals are not scanning much beyond the first page because generally they are only looking for the most current information, pages 2, 3 and 4 is old stuff. They will get to it when they need it if you make the grade on the first page. Number two and most importantly, what too many people just aren't aware of is that the filtering software, the resume filtering software that is out there, most companies by choice are setting up that filtering software so that it will only scan page one of a resume. Once again, they are looking for most recent, most current skill sets. They're not looking for the rest. Consequently, I have created this one page, pre-resume or short form resume document with the intent that you send that in first. It is loaded with the keywords that are in the job posting, and those keywords are artificially established and set at the bottom of the page, for the purpose of serving the software, not the recruiter. It is meant to serve the software, to get you through the pile so you get noticed. Then, and I hear this all the time when people use my process, the call they get from the H.R. professional is, "I just got your resume, but I need more information." At that point, you say, "I submitted my short form resume to get your attention. Evidently that worked. Let me have your email address. I will send over my long form to you on the spot, right now." That is it. It is kind of like Oprah, when she finishes a segment on TV she says, "Stick around. We'll be right back after this break. We'll teach you how to be a millionaire." Well, you stick around hoping that you are going to learn. It's the same thing. It is the tease model. Set it out there, but nail it. It is razor sharp. It is focused, and it made it through the software. Shelley: Absolutely. Going back 15, nearly 20 years now ... that's ageing me ... I was H.R. Manager in a startup facility and I had 1,500 resumes to go through for about 50 positions in the business. Rick: You know what? I appreciate that. I was with a friend of mine recently, and she has a little boutique staffing company. I mean little, four or five people and she operates an office here, in Houston, and also in Calgary, Alberta, Canada. At that moment in time, she had 1,100 resumes sitting in her inbox. That's a normal day. Shelley: Absolutely. At that time, that was when I became a fan of the one page resume. The truth was I rarely went past page one because I was just in overwhelm mode with so many. So I stand here saying to you, "Thank goodness somebody is teaching people about one page resumes," because it really is critical. But it is what you put on that one page that is so important. Shelley: You and I, in our previous discussions, are both of like mind, which is focus on your achievements, which you mentioned before, and be results focused. Do you want to share with everyone today a little bit more about what you feel is the most important thing to have on that one page resume? Rick: I will tell you what, the very first thing is in my header, and I have designed the header very distinctly and very deliberate. Anybody can go to my website, RickGills.com There is a pre-resume tab. They can click on this and they can view this information at no cost to them. The very first thing, the header has an enormous amount of information in a very small piece of space. The first thing I would like to say, instead of what to put on, how about what not to put on? How about leave off your physical address? That is the first place that a recruiter goes to and red-lines you because you live too far away from the job site. Am I correct Shelley? Rick: You agree with that? Shelley: Unfortunately, I know it happens - and I have a couple of times made decisions myself based on someone's address. Rick: I tell people, leave that off. Now myself, I live outside of Houston, Texas. I am not going to say where I live. I am going to say Houston, Texas if I am even going to put the name of the city. I want somebody to call me and say, "What part of town do you live in?" I am going to say, "Where is the job located?" When they tell me and it is an hour and fifteen minutes on the other side of town, I am going to say, "I can get there, no problem," because I want an opportunity at least to interview, even if I am not going to take the position. Rick: Don't build land mines into your resume that say "No," and that physical address is the first thing. Number two, I would like to recommend so importantly, after your contact information, I have created a single line that I call the seeking statement. It says, "I am seeking a position as a Chemical Engineer with Dow Chemical Company, reference number . . ."
The reason is I see so many, and I know you have too Shelley, I know you have seen so many resumes that did not bother to tell you what it is they have applied for, and you're not going to read all of that stuff trying to figure it out. That is 1950. That is 1970 maybe. So you say, I am seeking position as a ________, state the title exactly as it is stated in the posting or as you know it to be. The name of the company, now people think that is redundant. Why would you state the name of the company when obviously you are sending it to them? Well, the fact is it gives you points in the software. So use the name of the company. The reference number, so that the person who receives it knows to route it to the right place. "I am capable of . . ." and finish the sentence. To tell you a real quick story, Shelley, a friend of mine retired after 33 years as the Director of Staffing for one of these giant energy companies here in Houston, a personal friend of mine. I am writing my first book, and he calls me up one day and he says, "Rick, tell me about this book you are writing." I said, "Gary, in your 33 years of interviewing people, how many times has somebody come to your office and sat down across from your desk and said, 'I am here to increase shareholder value?'" He said, "I have never heard that before." I said, "Bingo. That's why I am writing my book." You have to stress your values. The objective statement is where you say, "I am capable of . . ." and you complete the sentence. "As a result of my previous experience, I am capable of managing . . ." That is the trick. Those are the things that I absolutely require in my one page document. Shelley: Fantastic. The results and what you can deliver .. it is just so critical to get out there, because if you're results focused, whether you are in a company that makes a profit or a non-profit, it is both the same, right? Rick: Oh, no question. I like to tell people that non-profit is nothing more than a tax ID. They still have to make money or they're not going to be in business the following year. Rick: One thing I would like to say too, Shelley, when somebody is creating an accomplishment, this is really critical, this is so important. When I am doing my live presentations I like to tell people, "Please listen to this, and if you take nothing else away from this conversation, listen to these two words - resulting in." Every accomplishment has a beginning, a middle, and an end. Just like every book, TV show, movie, everything. The beginning is I created, I invented, I implemented, I designed, I patented, I, I, I. But saying you did that doesn't give me a result. In other words, you may have invented something, but so what? I regularly see resumes, particularly here in Houston, I have seen a lot lately of paralegals who have been laid off, and they'll say something like, "I created a filing system." To that I want to say, "So what? Right, so what? You're on the street. Didn't work so well for you, did it?" How about, "I created a filing system that resulted in 400 man hours saved per month or per week or whatever." Now you are talking about the filing clerk that I want to hire. No question about it". So, beginning, middle, and end, you've got to give me a net result. I will tell you what, in the interview, same thing. Anytime you are asked about something, don't finish until you have given them a net result, because that is what they are listening for. Shelley: 100% agree. Rick, what tips do you want to give to our audience on how to start collecting that information, getting ready to put it into their one page resume? Rick: As far as collecting those accomplishments? Shelley: Go back to performance appraisals? Rick: Right. Well, performance appraisals is a great place to go, but I am always amazed at how many people don't keep that stuff, honestly. Go deep inside, and come up with a list, and then go through this list and create the whole thing. Once again, let me tell you a quick story. I was speaking at this place and this man comes up to me at the break and he says, "Rick, I want to apologize for texting while you were speaking." Honestly, I hadn't even noticed. I said, "Well, Joe, I appreciate you telling me that. Why?" He said, "Well, I really took to heart that I need to ask others I have worked for previously about accomplishments I had working for them. So I sent out a text to ten people I knew saying, 'What impact did I have on your business?'" He said, "Immediately, within three or four minutes, I had a text back that said, 'Joe, you saved the company.'" He said, "I had no idea what this guy was talking about." So as soon as the break came up, he made a phone call, and this man told him, he said, "Joe, without your vision and without your implementation of that sales program you brought to the company, we would have failed.'" He's like, "What?" He said, "This guy was not about to tell us that we were ready to go down the tubes, and he wasn't about to tell them after the fact." It wasn't unless and until Joe asked, that he learned that he had actually saved the company. That became his number one accomplishment on his accomplishment list, and about three weeks later, he got his next position. Shelley: That is amazing. Rick, the thing is, as you were talking about that example, it reminded me that you sometimes have to have a resume for every job just about. Shelley: So, you are crafting it to what the advertisement is looking for, and then using the keywords that the recruiters are looking for. Do you want to just expand briefly on that? FOLKS READ THIS NEXT SECTION IN FULL IT IS CRITICAL TO YOU GETTING THE INTERVIEW! Rick: Yeah, and I will tell you what, I will do that as if I am the hiring manager. Let's say that I have ten skills or qualities or requirements for my ideal candidate. I'm going to say Houston, Texas, Admin Assistant, College degree preferred, bilingual, English/Spanish, Microsoft Office, Excel, etc. So I go to H.R. and I give them this list and I say, "Here are my ten criteria. Please put an ad together, send it out, and let's see what happens." So in a week, I come back and I say, "How did that ad post?" They say, "It did well. We got 3,000 responses." Well, I've got a business to run, a department to run. I can't worry about 3,000 resumes. Remember, I talked about elimination selection. Rick: So I say, "Okay. Give me only those resumes that scored 90%." In other words, nine of my ten criteria are mentioned specifically in this resume. How did we do?" They go, "Well, we got 600." I was going, "Oh my. I can't deal with this." I say, "Okay. Then give me 100%. Now, here's my kicker, give me 100%+." Now H.R. and I know what they are talking about. Let me explain to you and to your audience. 100%+ means, that 100% is those 10 of 10 landed in this resume document that we received. The plus is really hyper-critical too, because the plus is the stuff that H.R. added to my ten. So let's say that my ten criteria were in there and they're in the document. However, H.R. added: Must be articulate, attention to detail, motivated, self-starter, team- player, all that. Those are also keywords. Rick: The person who best and most closely matches that job posting ... that is why I tell people, your one page document, and actually any document you submit, the first page has to, as much as possible, as closely as possible, mirror the job posting in terms of the terminology. Rick: If whatever does not naturally fit into the body of the document, then take my process and go to the bottom of the page and insert these in a section at the bottom of the page that is called keywords. It's is reduced in font size to about 8 point. Put a term, skip a space, put a term, and skip a space. There are no columns, no tabs. Don't do this in a footer. By the way, don't ever use a header and a footer in the software because they are not reading the header and footer. Rick: Leave it there. Just put these words down there. They are for the purpose of the software finding them, pushing your document to the top of the pile. You get a call. Shelley: Great advice, Rick. Great advice. Just to round that out, and those accomplishments need to talk to what they are looking for in the job criteria, correct? Rick: Absolutely. I appreciate your saying that because, let's say that you have created an accomplishment list that has 15 or 20 or more accomplishments, and let's face it, by the time you're 45 or 50 years old, you have those kinds of accomplishments. I tell people, put out 15, 20, 30, whatever, and massage those. You might take number 6, number 12, and number 15 for this position. You might take number 1, 2, 3, and 10 for this other position. So, yes, of course, shape them. Shelley: Fantastic. Well, guess what? We are about out of time, and I think we could talk for another half hour, so maybe we better catch up again another time. Rick: I would love to Shelley. This has been just a load of fun, and I really enjoy speaking with you. I am sure we will continue on an offline basis as well. Rick: "The Real Secret to Finding a Job." Rick: I thank you very much for that. Rick: If they want to find the book, go to RickGillis.com. It is available at Amazon.com as a paperback book, and I have the eBook available. I also have a college version, and the college book is about they need the experience to get the job, but they need the job to get the experience. So that is where I treat that a little differently. It is not a pre- resume. It is just a resume because they don't have a pre- history to talk about. Rick: So I have the college book and I have "The Real Secret to Finding a Job" book and RickGillis.com. Rick: Thank you so much. That was a hoot!